This first issue of GEAR begins with four incompetent cats who are assigned to high-jack a Giant Killer Robot. The plans are made, the cats lay in wait, the Robot comes and everything goes wrong. On the other side of town, two detectives find a body and a mystery unfolds. This book's got everything: Robots, harpoon guns, talking cats, gun shots to the head the whole sha-bang--What more do you want? GEAR is brilliantly written and penned by Douglas TenNapel. TenNapel is the creator of the cult hit video game / animated series: Earthworm Jim and the quirky claymation computer game: The Neverhood. He is also responsible writing and illustrating the 3rd issue of SCUD : TALES FROM THE VENDING MACHINE. Doug took a break from directing his first feature film to do GEAR. 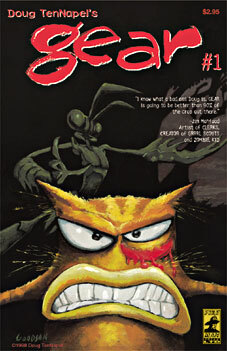 GEAR is chock full of action, goofy violence and TenNapel's unique brand of humor. Everything you've come to expect from Fireman Press Ltd.!